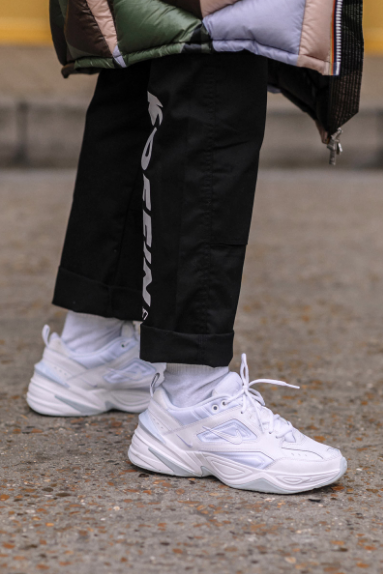 Whether you call it Chunky, Ugly or Dad this trend for big and complex sneaker silhouettes has been bubbling under for at least two years since our eyes first melted when the Balenciaga Triple S launch. It wasn't just out eyes that melted, the internet went crazy with public opinion as tempers bubbled over with heated views on the good, bad an ugly. The last 12 months have seen much more acceptance as many of the sportswear brands have taken design cues for the absurd and outrageous models we were exposed to initially and this has made the trend more palatable for the masses. However, the bizarre and lairy models are still dropping if that's your pref. To the casual observer and core sneakerhead this whole chunky trainer vibe came as a bit of shock, especially when clean, slim and minimal trainers were the go to for many years. I recall a conversation with New Balance in 2013 and they were very concerned with the tapering of trouser legs and the slowdown in demands for New Balance trainers as the chunky aesthetic had begum to jar with the current trouser and denim styles....how times change as New Balance are central to the en vogue movement. We mentioned skinny and tapered trousers early, but don't think buy purchasing a pair of chunky trainers you have to re-think your whole wardrobe. Its just not the case. The best way to style chunky trainers is to wear layers, and some oversized sweatshirts and jackets as this will balance out the footwear. 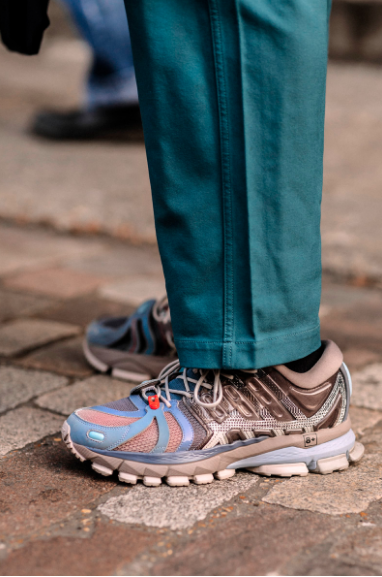 Tapered trousers will still look fresh, but if you are looking for a legwear maybe consider a wider and cropped trouser leg as this will harmonise with the chunkiness of the trainers. There are two distinctive segments within the chunky trainer world as we see the sportswear brands re-issuing cross training and trail shoe classics from the 80s and 90s, coupled with those we see mid & high end fashion brands re-imagining sneakers through the lens of runway fashion. First off we're going to round up the best from the a sporting goods perspective, these are brands you will be familiar with and some of the trainers might give you a warm and nostalgic flashback to sneakers from the golden era. 6: Puma have made big plays in the Chunky Trainer marketplace especally with the Thunder Spectra. 5: Yep, this is the model that Steve Jobs put on the map. Its the epitome of dad trainers. 4: The Yung-1 is a take down of some of the more extremely chunky models. 3: We love the complex upper panelling and the contrasting air unit. 2: New Balance do the chunky aesthetic with retro styling which makes them very wearable. 1: Left field winner with the pumped up Saucony Xodus ISO 3. So, we've rounded up the best models that we would cop/rock from the more traditional sportswear brands and now its time to reveal the shortlist from the designers and manufacturers of chunky trainers you may be less familiar with. 6: The shoe that started the trend. We had to include the Balenciaga Triple S.
5: Not the typical chunky look, but an element is the heavily contoured midsole and this Zanotti Urchin has that licked. 4: CK has been making moves, and the Strike 205 is the best yet. 3: This is Virgil Ablohs first real effort in the chunky trainer space and its a winner! 2: This is the unintentional right here...its a trail running shoe, but has the look and colour pops ton please the runway fraternity. 1: High end meets sportswear with this Martine Rose collab with Nike on the iconic Monarch IV.